The most dangerous mountain on the planet, deep in the hinterlands of India’s Garhwal Himalayas, soars 21,850 feet off the deck. Mount Meru carves the sky with a massive, stone replica of a great white shark’s fin. Just like the smaller marine version, it’s a big warning signal. The Shark’s Fin route marked on Mount Meru. No mountain has seen more climbing attempts or failures. Can any mountaineer team slay this gargantuan, granite “Jaws”? It calls for grim levels of pain, sacrifice, and a sustained stare-down with the Reaper. Who’s got the right stuff? There’s a specific group of hard men who take this particular brand of hardship as joy. Joy! Who are these men and what’s the matter with them? Fighters, footballers, spec-ops military, and extreme sportsmen, for sure. Men with stereotypically huge sternocleidomastoid neck muscles and ax-chopped cleft chins, right? Not necessarily. Like football legend Jim Brown once said, “Tough guys come in all sizes.” The guys on the Shark’s Fin assault team are mostly don’t-judge-a-book-by-its-cover types. These mountain warriors, much like their special-forces military warrior brothers, tend to be understated, humble guys. But make no mistake—in the vernacular of the current men’s movement, this chill group of dudes who speak climber-speak (a variant of surfer-speak), are outrageously warrior-quadrant dominant. 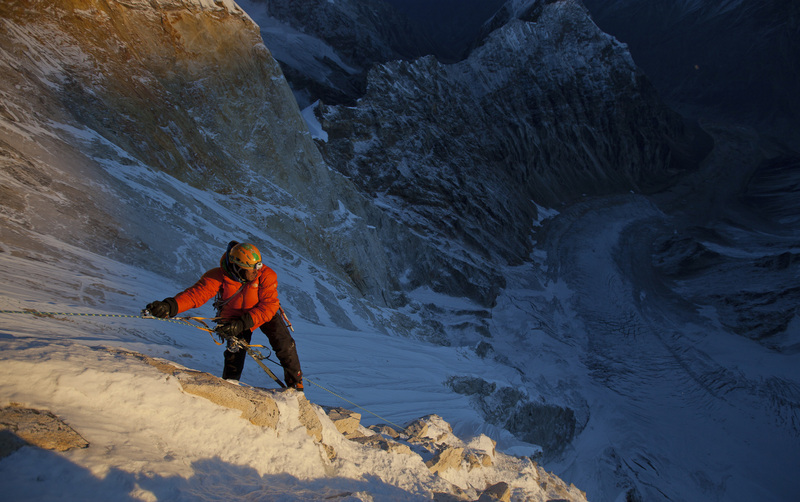 The outstanding climbing documentary “Meru,” winner of this year’s Sundance audience award, (narrated by master alpinist Jon Krakauer), is a gut-check demonstration of this extreme grit, and it opens the door to a rare insight into what makes such men tick. It’s also an education in the largely lost wisdom of how men archetypically relate to one another as men and in teams, and their brotherly forging into unknown territory to fulfill their missions. In Tom Wolfe’s book “The Right Stuff,” about Navy test pilots, there was a bar where the screen door slammed, the whiskey flowed, and test pilots who flew screaming jets past the sound barrier before it was safe told high-danger aviator tales. Yosemite Valley’s Camp 4, home to the world’s rock-climbing elite, was also such a place. It was a last outpost of America’s Wild West, hard-man ethos—where big wall climbers told tales of desperate deeds up on high-crag routes with names like Lost Arrow Chimney, Pacific Ocean Wall, Mescalito, and Snake Dike. There’s a tradition in the areas where men live on the edge, where legendary figures grow into myths, and the elders look with quiet satisfaction and excitement to the jaw-droppingly talented “young Turks,” the next up-and-coming. Such talent hints to us of our ability to transcend the earthly. It can, after all, result in an immortality of sorts; heroic deeds remain forever alive in the storytelling. And so, like jazz musicians keeping an ear to the ground for the next Coltrane or Charlie Parker—mountaineers look for the next rock-and-ice warrior. In terms of climbers, the “right stuff” means a mind as impervious to distraction as a Brink’s truck is to bank robbery. 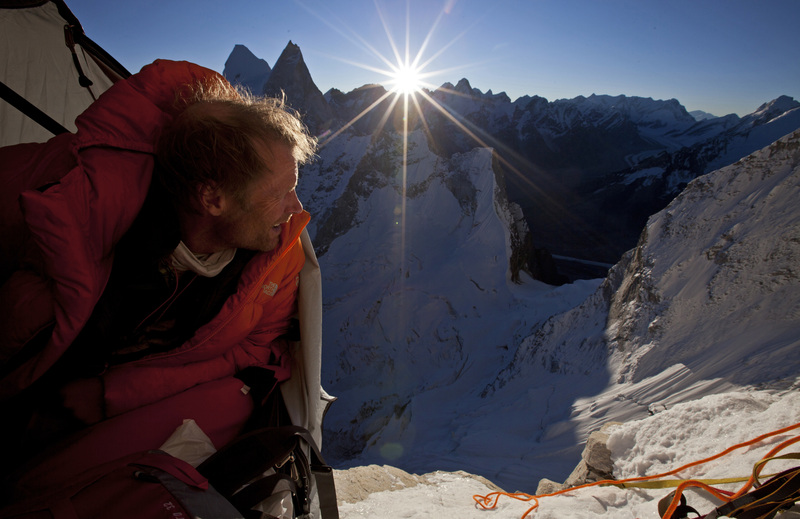 Conrad Anker, superstar mountaineer, is father to a family of four towheaded kids. Actually, they’re the kids of his former climbing partner, Alex Lowe, who fell to the Reaper in an avalanche in October 1999 on Tibet’s Mount Shisha Pangma. But wife and kids cannot tie a man with this degree of mountain-warrior spirit down. It should—and the men know it should. But it can’t, and it won’t. They won’t let it, ever. The women who marry this type of man know this—ask any military wife. These men who live with constant, daily pain burn off the trivialities of human existence. 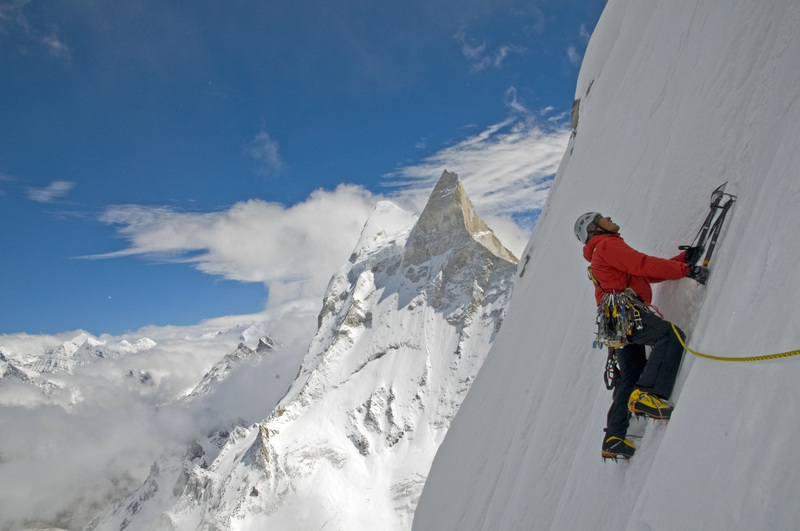 “Meru” filmmaker and longtime climbing partner of Conrad Anker, Jimmy Chin says: “The more nonchalantly Conrad asks me about something (climbing the Shark’s Fin), the more I should be worried. Meru had a reputation of being impossible.” They went looking for a third on the rope. Speaking of “young Turks,” they’d heard of Renan Ozturk. Cue electrifying footage of Ozturk’s desert free soloing (climbing without a rope) hundreds of feet up, quarter-inch ledges to step on and thin holds and cracks to grip—absolutely horrifying to civilians. Who better to have on your rope than someone who doesn’t need one? 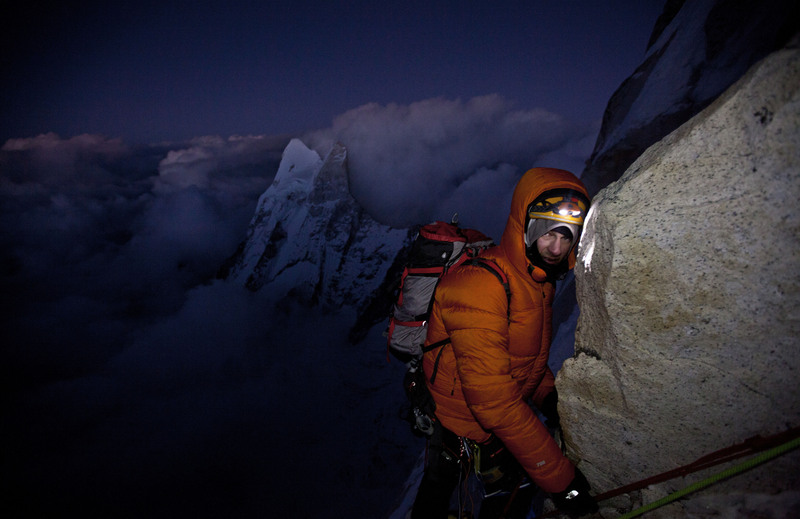 As Krakauer relates in one of his many talking-head interviews featured in the film, the Shark’s Fin is a test of master climbers. 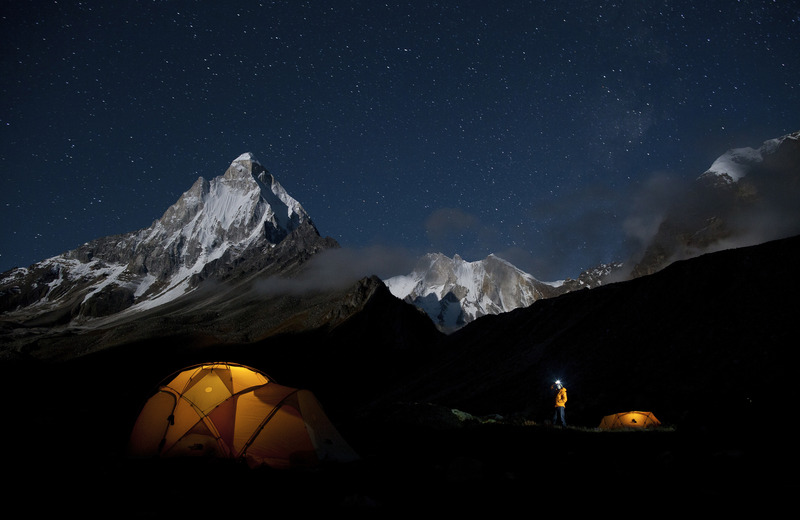 It’s considered the anti-Everest; there are no Sherpas to haul gear—you haul it all. It also requires a mixed bag of wide-ranging skill sets. You must rock climb, ice climb, mixed climb, big-wall climb, have endurance for altitude and severe cold weather, and have deep muscle memory of the intricacies of advanced aid climbing. 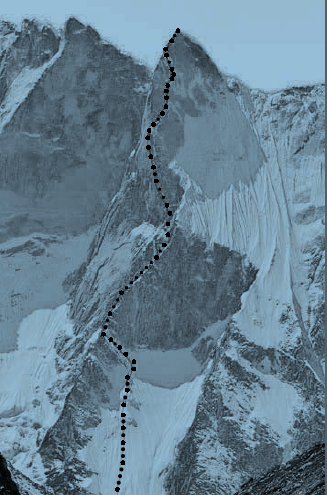 The first 4,000 feet are doable, for most climbers, but then it’s big-wall climbing out on the fin. Way up there, you might get 200 feet in a day, and you must haul a portaledge (a cot with a tent over it, anchored on a drilled bolt), 50 pounds of big-wall gear, ice gear (axes, screws, and so on), plus food and water. Essentially you’re hauling 200 pounds for 16,000 feet, or until supplies run out. Climbers love the word epic. Jimmy Chin, in an interview with the Epoch Times, with classic rockclimber self-deprecation concerning his abilities, said that when it comes to climbing, much like the Saturday Night Live designation of the “utility man” (actors like Will Ferrell with a wide-spectrum of abilities, who can make any scene work), he would be the climbing version. That’s of course the understatement of the year—the whole point of this climb was that all parties involved had to be utility men, and not just ho-hum jack-of-all-trades utility men. They needed to be masters of all; straight-up wizards in each category. Which is why this project is such a monolithic achievement. However, when pressed, Chin says that if he had to pick a specialty, he feels pretty solid in aid climbing, which calls for the ability to be laser-focused for mind-destroying periods of time. Aid also calls for the ability to continually manage one’s fear, which means defining what’s perceived fear, as opposed to what’s an actual risk, and being objective about those risks. When do you do this? Like, for instance, when you’ve got your entire weight suspended off a few rurps (postage-stamp-sized “Realized Ultimate Reality Piton”), looking at a possible thousand-foot death fall, while drilling a bolt for 6 hours straight. These mountains are holy places, and many elaborately face-painted holy men line the path to the base of Meru, meditating on rocks along the holy Ganges River. Like “bivouac” and “ops,” there are other combat comparisons in climbing. Belaying in a steady stream of falling rock and ice is “taking shrapnel.” It is war. It’s just as deadly. This is where men develop the selflessness to die for each other. Every now and then the camera backs off, and we’re hit with absolutely magnificent views of the mountain and surrounding ranges. The only word that comes to mind trivializes it—beautiful. A severe weather system encroaches, and the three climbers get caught in the portaledge for four days in cramped quarters. We get to hear the avalanches roaring down the side. It looks cozy to the viewer, in the tent there, and when they look out at the snow, Jimmy says the storm feels like Christmas. That’s deceptive. It is all very, very, very unsafe. They speak of it as “samsara” (the Buddhist concept of the suffering inherent in the cycle of human and animal earthly incarnations). It is their “bivouac of suffering. 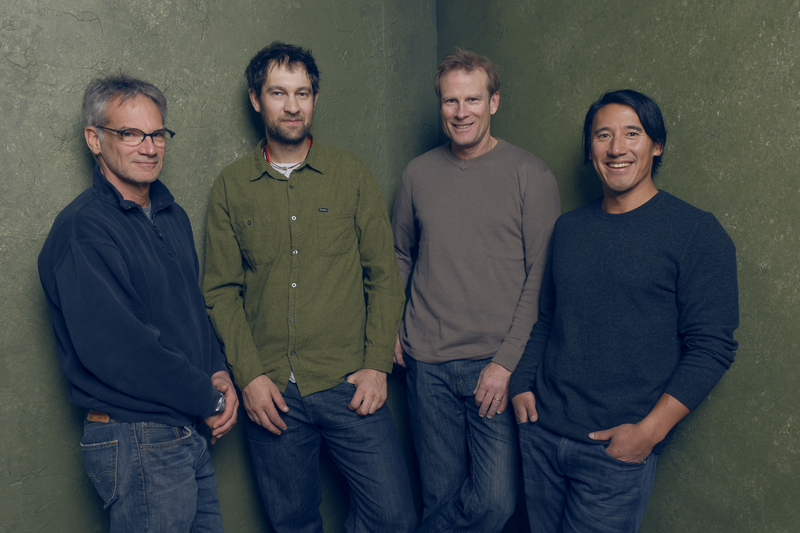 Narrator Krakauer jumps back in to explain the role of the mentor in climbing. The now mythic Mugs Stump was Conrad’s mentor. It’s the traditional Eastern martial arts teacher–student relationship. Young men need teaching, testing, challenging, and forging. And they especially need an older male’s 100 percent trust in their abilities. Now, Conrad is mentor to young Ozturk, who, albeit insanely talented enough to free solo at heights that make the average mind freeze up, has no experience with climbing in minus 20-degree weather and harbors, in his mind, a place of wanting to quit. But he doesn’t want to let the team down. This is where men develop the selflessness to die for each other. Up on the fin, they run into totally blank sections of rock. Krakauer explains the extreme edge of dicey, “A4” aid climbing, of drilling bolts to hang ladders from. “It’s like being a cabinet maker,” he says. Jimmy is filmed gingerly tapping the big slabs of granite with a hammer: “tonk-tonk-tonk.” Hollow. “Those are the sounds you don’t like to hear,” says Chin. It’s the “house of cards” pitch: 10,000-pound stone slabs, stacked haphazardly, that move under his weight, horrifyingly. “If a real cabinet maker splits the wood, he can get another piece. As a cabinet maker drilling bolts in extreme aid climbing, you split the wood—you die,” says Krakauer. The trick is to keep the risk manageable. Seventeen days in, 100 yards short of the summit, they have to turn around. There’s relief and heartbreak. There’s no summit bid because it would mean an unsustainable, extra night sleeping on the cliff face. They’ll take no such stupid risk. This is the control all hard men seek. Author Tom Wolfe explains the unspoken creed among test pilots: “A man should have the ability to go up in a hurtling piece of machinery and put his hide on the line and have the moxie, the reflexes, the experience, the coolness, to pull it back at the last yawning moment.” So as to be able to—in this case—climb another day. They take time off; Jimmy and Renan go to Chad and Borneo on filming jobs. Renan goes extreme skiing with pro snowboarder Jeremy Jones and busts his head wide open, coming within a miraculous millimeter of being a vegetable, and losing half the blood supply to his brain. Another miracle: Jimmy, also skiing, gets caught in a massive avalanche, rolling and twirling amid huge, crushing blocks of ice and snow, only to get spit out, whole and alive, at the bottom of the mountain. “I survived what people don’t survive,” he said. Renan didn’t tell his girlfriend he was going back. And, busted skull and all, they’re back at it. Extreme adventure! The portaledge breaks—they jerry-rig some athletic tape, part of an ice ax, an ice screw—back in business. This second attempt is outrageous. The personal and group challenges they overcame must be witnessed. American climbers Anker, Chin, and Ozturk summit on Meru Central (20,702 feet) on Oct. 2, 2011, via the Shark’s Fin, in 12 days. That’s no spoiler. It’s a teaser, trust me. Such talent hints to us of our ability to transcend the earthly. Post-climb, we see the photos of frostbite and trench foot: feet so cold, and so wet, for so long—they’ve begun rotting. This is the mega-pain. This is the addiction. We want to know why. It’s said of some ultra-runners, who run 100 miles in one shot, that they have a fierce purity. The same is said of certain military communities. These men who live with constant, daily pain burn off the trivialities of human existence. They have completely sweat out the small stuff. The sign above the entrance to Dante’s Inferno reads “Abandon hope, all ye who enter here.” One must go through hell to get to heaven. Sitting in the classic Buddhist double-lotus position is said to burn off—by forbearing pain—one’s karma. Same with the hair shirts and self-flagellation of the medieval ascetics. So men (and women) who live with pain is this fashion may be on a sporting version of a path to spiritual enlightenment. Rudolf Steiner, renowned Western mystic, scientist, philosopher, and founder of Waldorf schools, predicted sports would be the Western world’s segue to spirituality. See “Meru” and decide for yourself. Oh, and by the way—Chin filmed this whole thing himself (with assistance from Ozturk), while climbing the Shark’s Fin. And like they say—behind every great man, there’s a great woman. In Chin’s case, that would be his wife and partner-in-crime, the beautiful, Princeton-educated filmmaker Elizabeth Chai Vasarhelyi. Expect more electrifying adventure films from these two.